After travelling and seeking the world’s barbeque trail, if I had to pick my favorite region it would have to be Southeast Asia. In my homeland of Malaysia, pushcart satay vendors are found grilling their marinated chicken and beef cubes on bamboo skewers over red hot charcoal grills at the night markets and along main streets. It gives off an inviting aroma mixed with smoke, enticing hungry patrons to flock to their stalls. Although, I have shared a chicken satay recipe in this chapter, there is a difference in the way this lamb chop satay is prepared. Instead of lacing the meat on skewers, in this recipe the entire chops are marinated in a classic coriander and sweet soy, relying also on the charred amber colored fat that will enhance the entire experience. I love serving the chops with a squeeze of fresh lime juice for a vibrant flavor. Prepare the marinade; combine the coriander seeds, black and white pepper, cumin, sweet soy sauce, lime juice, salt and extra virgin olive oil in a food processor and process to mix thoroughly. You should obtain a rough aromatic paste. Place the lamb chops in a bowl. Pour the marinade over the chops and rub the marinade all over to infuse the flavors into the meat. 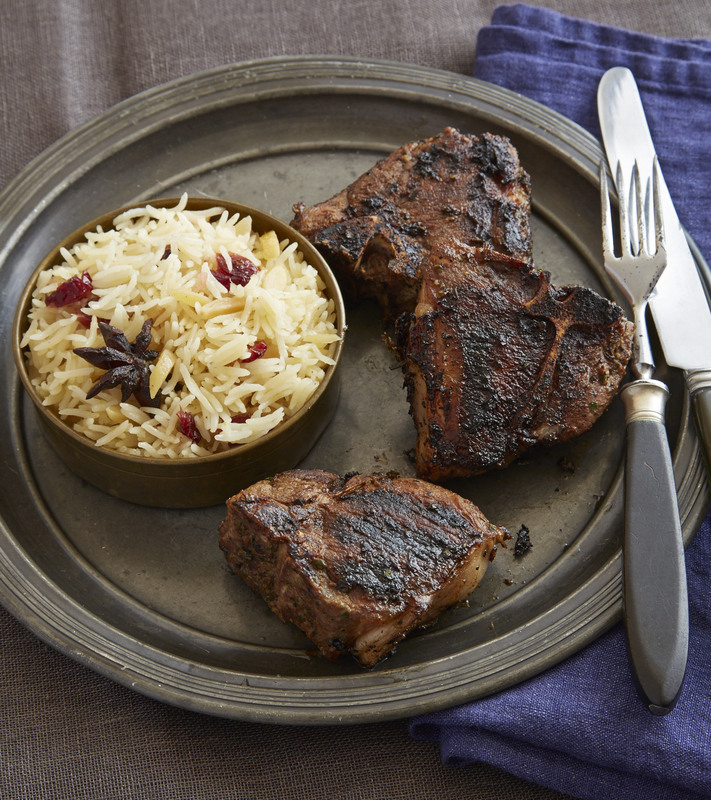 Allow the lamb chops to marinate for at least 1 hour or preferably refrigerated overnight for a full flavored chops. Pre heat or light the grill. Grill the lamb chops over medium-hot fire until just cooked through, turning the meat a few times until medium if preferred, about 5 minutes. Transfer the lamb chops to a platter and garnish with limes wedges and serve.